Now that we are familiar with the inertia generated Shaking Forces and Couples common to any machinery with a Reciprocating Mass (anything with one or more pistons and connecting rods), let’s move on to Combustion Generated Vibration including torque pulses, things peculiar to machinery with fire inside a cylinder. Combustion is often thought of as an explosion, but normal combustion is really a very rapid progressive burning process. Normal combustion in a gasoline engine, two-stroke or four-stroke, starts at the spark plug. The initial kernel of flame becomes a flame front that moves progressively outward in all directions until the entire fuel-air mixture is consumed. This takes a very short but measurable time, so the spark must be supplied somewhat before TDC (top dead centre) at high RPM for an engine to make good power. Needed ignition lead time requires that the spark occurs 20 to 30 degrees of crank angle before TDC, corresponding to about 0.001 second at 4000 RPM. This results in the peak combustion pressure occurring at TDC, allowing the maximum energy to be extracted from the expansion of the combustion gases on the downward stroke of the piston. The expanding combustion gasses that push downward on the piston push equally hard in all directions. The cylinder wall is a symmetrical diameter, so the sideways forces are balanced, but the top of the combustion chamber is pushed upward with a force equal to the downward force on the piston. This force tends to rock the entire engine back in a direction opposite to the direction of crank rotation. This rocking motion is resisted by the engine mounting, so it is felt by the rider each time a cylinder fires as a pulse or throb throughout the bike. The frequency varies directly with RPM, and with number of cylinders and firing spacing. 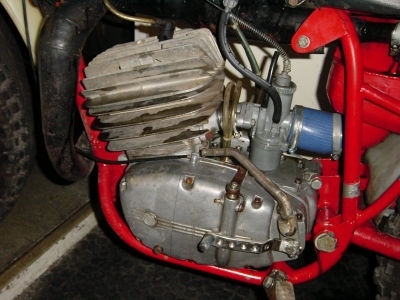 It also varies with throttle opening, and is most apparent at low RPM, WOT (Wide Open Throttle) in a big four-stroke single, but is almost undetectable at high RPM in a two-stroke twin or four-stroke multi. To provide motive power, the combustion force is transmitted from the piston(s) to the connecting rod(s) to the crankshaft, on thru the primary drive and transmission to becomes a pull on the final drive chain. This chain pull both lifts the front of the bike (anyone for a wheelie?) and accelerates the entire bike and rider forward. The chain pull comes in intervals, evidenced as a vibration the rider may be able to feel at low RPM. It is proportional to the engine firing sequence, but at a lower frequency due to the primary drive and transmission reduction ratio. Flywheel mass is used to smooth out these power pulses. A light flywheel makes an engine and the bike quick to accelerate, but one that is too light will let the pulses through and can make an engine difficult to kick start and reluctant to idle slowly. A heavy flywheel smoothes out the pulses but can make an engine feel “lazy” and slow to rev when the throttle is blipped in neutral. Older BMW twins have heavy automotive type flywheels and clutches, and exhibit this characteristic as well as a tendency to roll the bike to one side due to the lengthwise crankshaft. In addition to the power pulses generated by normal combustion, abnormal combustion can create high frequency vibration that is more often heard than felt. If the engine is overheated, or there is a bit of red hot carbon in the combustion chamber or too hot a spark plug that has a glowing red electrode, combustion may start before the timed ignition spark. This is called pre-ignition. Combustion is completed normally but because of the early start it is completed while the piston is still moving upward in the cylinder. Very high cylinder pressure results and the engine feels rough and exhibits a deep throbbing sound, most noticeable at low RPM, WOT. Under some circumstances, pre-ignition and even normal ignition can result in a somewhat similar condition called detonation. Detonation occurs when the combustion process becomes an explosion rather than progressive burning. Combustion may start normally at the spark plug or ahead of the spark at a hot spot, but as the flame front progresses it both heats and compresses the remaining unburned mixture ahead, which then self-ignites at multiple ignition points. This is an explosion rather than a progressive burn. The result is a very sharp pressure rise; the flame front hits the piston, walls and cylinder head like a hammer blow, which ring with an audible “spark knock” or “ping”. Pre-ignition and detonation occur as overlapping and somewhat interchangeable conditions. Causes are fuel octane that is too low, an overheated engine, or combustion that starts too early from either a hot spot or incorrect ignition timing. Brief periods of detonation during a hard acceleration are usually harmless, but protracted detonation can cause engine damage. A holed or seized piston is the usual result, especially in an air-cooled two-stroke where piston temperatures are generally high and lubrication somewhat marginal. Climbing a long hill on a hot day in second or third gear where the slow bike speed limits cooling is likely to cause trouble if anything else is “off”, such as overly advanced ignition timing, too hot a spark plug or low fuel octane. Most CZ and Jawa engines have fixed ignition timing, with the breaker points on a stationary plate and operated by a cam fixed to the crankshaft. This is a simple, reliable and inexpensive system that is common to most small engines. The timing is set by having the ignition points open at a specific crank angle before TDC. This is accomplished by setting the piston to a measured position that corresponds to the desired crank angle, then rotating the breaker plate against crankshaft rotation until the points just open. The desired timing was determined long ago on a dynamometer in a Czech engineering department, as optimum for full throttle operation at the RPM for peak power. It is only correct for that one set of conditions; too early for a smooth idle and too late for best fuel economy at part throttle cruising. The timing compromises are not great except at idle, where it results in the familiar irregular firing. An irregular idle is a form of vibration, and is tolerated in a vehicle that seldom idles for more than the length of a red light. The fixed timing is also too early for low RPM, WOT operation, and as a result there may be detonation or “pinging” on hard acceleration. The sound is usually lost in the exhaust and intake noise, and because the duration is brief no harm results. From Wanderings International, the newsletter of The North American Jawa CZ Register, with thanks.